A new book on Ottoboah Cuguano brings to life the history of eighteenth century anti-slavery agitation. In June 1985 the Daily Mail reacted to and sought to lampoon Lambeth Council’s announcement that they planned to name some thirty-five council buildings after prominent black historical figures. ‘This plaque honours the memory of Mister Cuguana — Mr Who?’ they headlined, purposely or not mis-spelling the name of the great African anti-slavery pioneer and writer Ottoboah Cuguano, whose hugely influential book Thoughts and Sentiments on the Evil and Wicked Traffic of the Slavery and Commerce of the Human Species, had been originally published in 1787. Cuguano’s essential contribution to the mass movement against slavery and the slave trade has been woefully neglected over the years, and now Martin Hoyles, who is the author of a biography of the black Chartist leader William Cuffay, has written a book, Cuguano Against Slavery, which will help to remedy the widespread ignorance about Cuguano. He was born on the Ghanaian coast around 1757, where his father was a companion of a Coromantee chief. In 1770 he was kidnapped by slave traders within his own people and sold into slavery. Transported through the agony of the Middle Passage to the Caribbean island of Grenada, he worked as a slave on a sugar plantation before he was ‘delivered’ from ‘that horrible brutal slavery’ by becoming servant to a Mr Campbell, who brought him to England. Now free, he learned to read and write in both English and French, married an Englishwoman and by the 1780s had become a servant to the artists Richard and Maria Cosway. His book, (also published in Paris in 1788) became a powerful campaigning tool as he toured England with his anti-slavery speeches and corresponded with royalty, politicians and power-brokers, connecting the struggle against slavery with the rights of the oppressed in Africa and India and the poor and exploited in his adopted country. 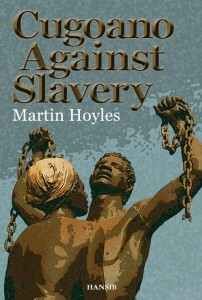 Hoyles is the most allusive and contextual of writers, and pitches his life of Cuguano powerfully within the ferment of anti-slavery agitation of the final years of the eighteenth century, so that the reader not only learns of the life, struggle and achievement of its brilliant protagonist, but the world in which he essayed and campaigned, along with his black and white anti-slavery contemporaries, from Equiano to Clarkson and the thousands of demonstrators, petitioners and organisers who set English cities like Sheffield, Manchester and London afire with their agitation. As in his book on Cuffay, he includes a wealth of illustrations and quotations which help to make Cuguano’s words and actions come vividly to life. His brave and eloquent testimony will endure and last longer than anything written in the Daily Mail, opened up by Hoyles’ committed writing and compiling, and Cuguano’s words have neither lost their power nor softened their relevance for millions still suffering the degradation of forced work and trafficking. Cuguano Against Slavery by Martin Hoyles is available from Hansib Publications for £9.99.